I guess I’m on a game card streak. At least as far as titles go. My quiet house was turned upside down this weekend. My daughter Emily, her husband, and my two grandkids came into town Friday night and stayed until Wednesday morning. Emily hadn’t met her niece yet so Matthew and his wife made an effort to bring the baby over as often as possible. It hit me about 10 PM Friday night. Hey! I have all four of my kids under the same roof. And all three of my grandkids too. I couldn’t have been happier. The pool was a hit. The water was only 62 degrees, but the kids didn’t care. I don’t go in until it’s at least 74, but I prefer 76 or higher. 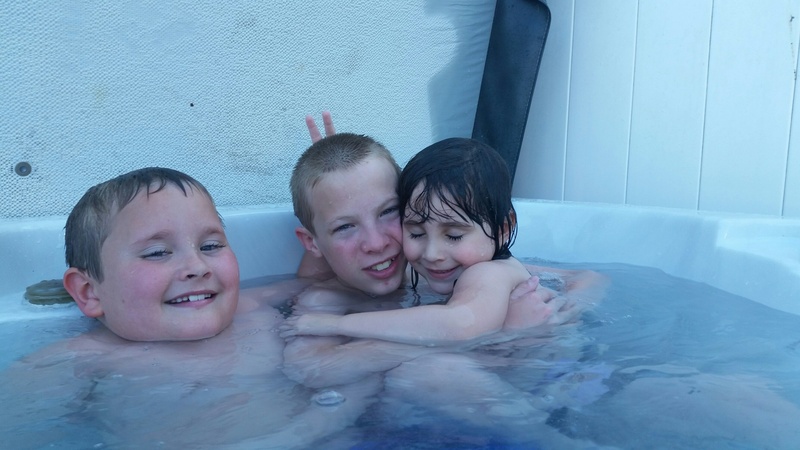 An even bigger hit was the hot tub. Colin said to me at the end of the weekend that if he never hears the words pool or hot tub again, that would be fine with him. They were relentless. But look how darn cute they are! Frankie was a proud uncle all weekend. Now don’t get me wrong. I am still OCD. I actually did pretty well. My house and yard looked like a tornado had hit. I find I can do about a day and a half completely ignoring it. Then I flip out and have to do a massive re-ordering so I don’t go crazy. We had a big fire Saturday night and my neighbors came over. The next morning was Parker’s 8th birthday party. At 9:45 AM I woke everyone up who was still sleeping and cracked the whip. My neighbor popped over later and said he couldn’t believe it. It only took about an hour and a half with all of us, by the yard was completely transformed as was the house. There were two lawn mowers going, the kids were banned from everywhere possible, and soon everything was party ready, including the feast that Emily had prepared. I told Colin it would be amazing if we had that much help every week. By the time they left, I was utterly exhausted. My house was trashed. My yard was trashed. There were moments when I thought I would go bonkers. But overall? Overall, I was thrilled to have my house full of life and people and relationships. If only I could figure out how to make it happen more often. Categories: Misc., Parenting, Uncategorized | Tags: children, fires, grandkids, hot tub, lawn, Memorial Day, OCD, pool | Permalink.